What happened to the cabbage overnight? Who’s responsible for the holey and disappearing leaves? Most likely the larval stage of the White Cabbage Butterfly! Haven’t you seen those white butterflies flitting about the place and landing on most every plant for a brief moment before they resume their flight of fancy? These insects seem really, really busy. And they are. They’re probably sipping nectar in between laying eggs on the plants they alight upon – most of them in the Mustard Family or Brassicaceae. 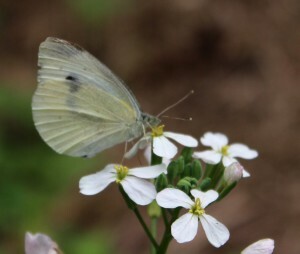 Their color is almost all white with a dark corner and a couple of dark spots on their fore wings. 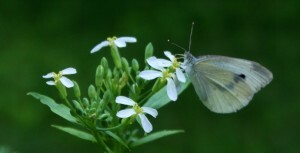 Maybe their color is more like a blend of yellow and off-white, but most people would describe them as a medium-sized, white butterfly. The cats really enjoy watching the butterflies go about their business. I seem to be a little irritated by them, but that’s only me thinking that they’re eating some of the food items we planted for ourselves. Oh well, I guess we can try to live in harmony, huh? Sprinkle or dust some DE on the cabbage leaves and sprinkle a ring around the base of other garden plants to keep pests at a minimum. Diatomaceous earth kills garden insects. This free-flowing powder is an organic gardener’s solution to many pests, green cabbage worms included. The alternative is to do nothing and sort of ignore the caterpillars. 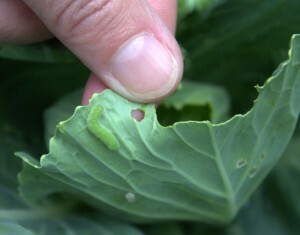 Holes in cabbage leaves only go so deep as the butterfly larvae are active during a short time span of the cabbage’s life. The cabbage plants being munched on now won’t be harvested for a couple of months. Leaves are pretty tightly packed together in the center of a head of cabbage and the leaves that the green grubs are eating will be the outer leaves that we take off of the cabbage head that we eat, so it’s all good. Daily inspection of the garden inhabitants is one of the best things you can do to keep your plants healthy. Look for signs of plants in distress or in need of water. 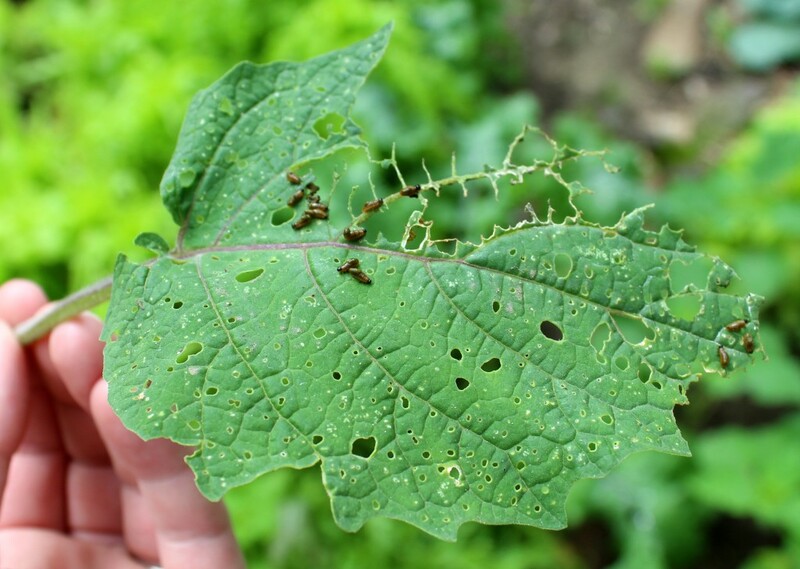 Look for leaves with holes or leaves missing altogether and seek out the pests who were responsible for the damage. The ground cherry or husk tomato plants are just now starting to flower. The plants are about a foot tall. The leaves have had tiny holes here and there and the presence of small black beetles was noticed but due to their size they weren’t thought to be a problem. They looked like they wouldn’t eat too much, so they were left alone. Now that I’m thinking about it, I also remember seeing a potato beetle a few weeks ago. Too bad I didn’t know then what I know now. The Three-Lined Potato Beetle, Lema trilineata, is a real garden pest. Unfortunately, their name suggests they’d stick to eating potatoes, but that just isn’t true. They seem to have a real taste for any member of the Nightshade Family. We’re seeing the larvae eat leaves of the husk tomato and the tomatillo. When they were first spotted, a somewhat skeletonized but mostly gone leaf was turned over to find black-headed yellow grubs. And it turns out that they did… wear their own excrement. Ewww! 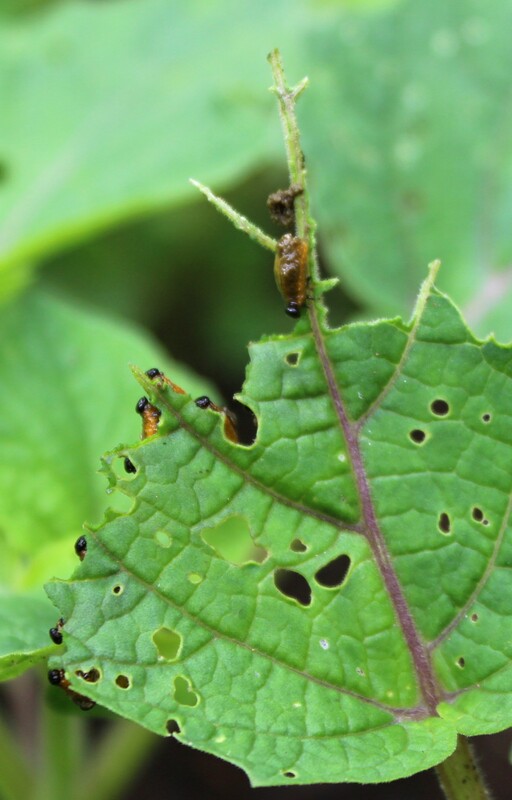 Tomatillo plant grubs are the larval stage of the three-lined potato beetle and they are definitely what most people would call gross. Wearing their own poop…is that supposed to be a predator defense mechanism? They eat in groups, too. Look right at the edge of an eaten leaf and there you will find the herd. Saw three badly infected leaves and removed them from the plants. 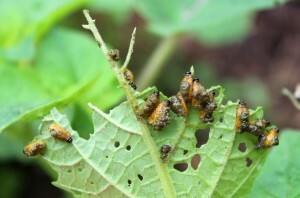 Inspected the back side or underside of many leaves for additional larvae and adults. Will continue to inspect for yellow eggs laid in clusters. Saw one tomatillo plant also infected with potato beetle larvae. Manual removal and disposal of only 2 leaves so far. Other small amounts of beetle larvae were wiped off the plant leaves with fingers and crushed. Yeah, it was gross! Dealing with beetle grubs is just one of the little things you have to put up with when growing organic. We won’t use any nasty chemicals to “get rid” of the beetles or larvae because we don’t know the complete effects of that pollution. It’s pretty easy to take care of the beetle larvae when they’re seen. Use a glove or a leaf if you have to keep your fingers out of it, and just wipe the little buggers off of there! Use a bucket of soapy water to stay clean or for collecting infested leaves, beetles and all.